Wash fruit and dry on kitchen paper, halve strawberries and place all fruit in a shallow dish. Heat compote with 3 tbsp water cool and pour over fruit. To make the caramelised crumbs: Heat oven to 200C/ 400F/gas 6. Melt butter in a large pan, add the breadcrumbs, sugar and cinnamon, mix well. Spread evenly on a large baking tray and bake, turning a few times for about 15 minutes or until golden brown, cool. 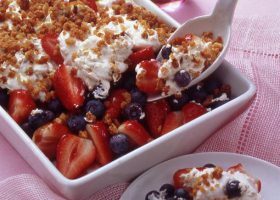 Mix yoghurt, crème fraiche and ½ of the crumbs, spoon evenly over the fruit sprinkle over the remaining crumbs.